I recently heard that Blue Force Gear was coming out with a new line of gear. The new line was called D.A.P. (Denied Area Pattern) www.dappack.com. The first item to be released was the D.A.P. Pack (small) along with accessories for the DAP Pack. The DAP Pack (small) is designed as a 1 day pack. 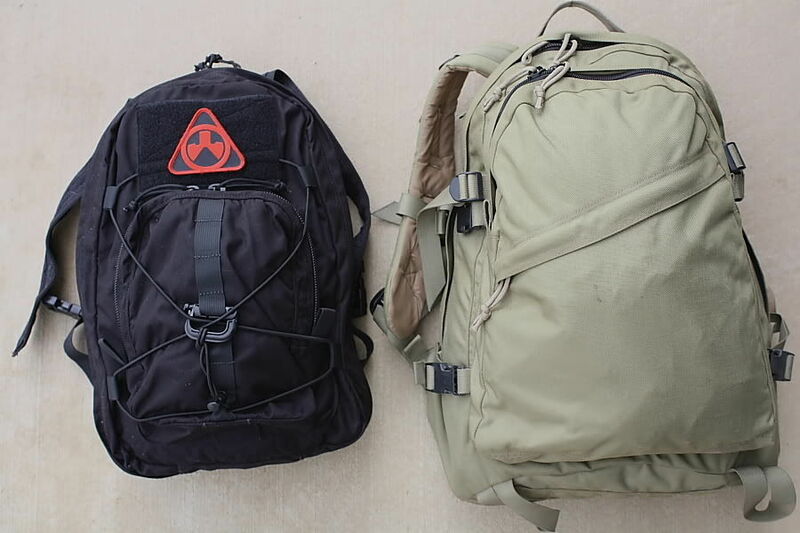 I've been using a 3 day pack "Assault Packs" for my daily needs for several years. Often times I find that a 3 day pack is too large, cumbersome, and bulky for most of my day to day needs and a smaller and thinner pack would be much more useful. There are still times where I have a need for a 3 day assault pack, but for a majority of day to day needs, smaller is better. -At business / trade expo�s where I'll be picking up catalogs, etc. I've been using the D.A.P. Pack since July of 2009 to carry gear and personal items to and from work and for other tasks at work. I have found that the size of the D.A.P. to be perfect for may day to day needs. 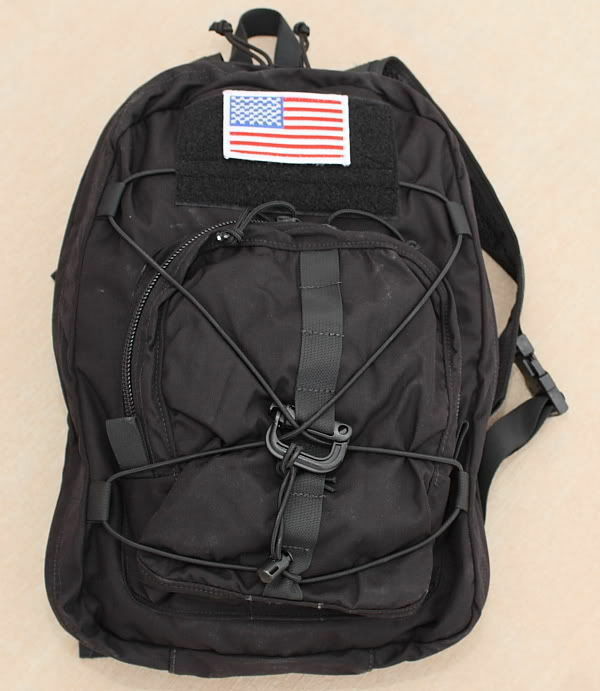 The pack has a discreet, low profile, and has a non-military appearance. 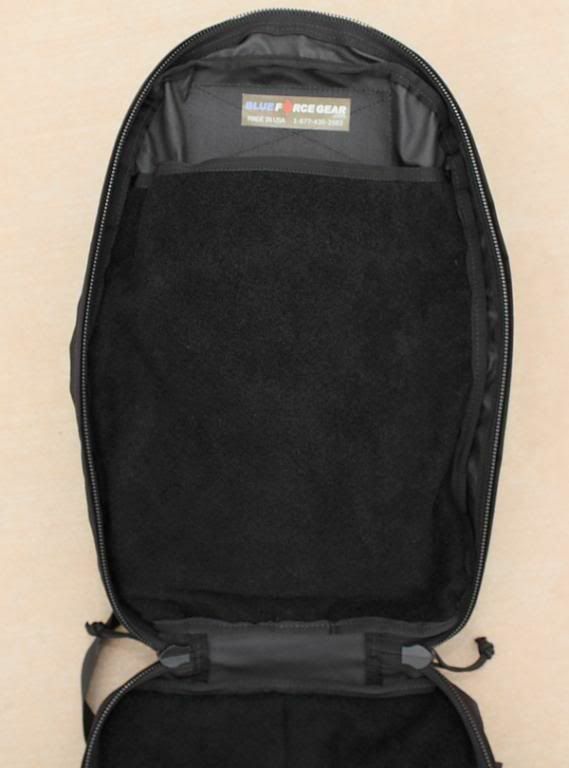 The entire main compartment (both sides) is lined with Velcro and accepts any of the DAPPER accessory pouches / loops / magazine pouches / pannels or any other accessory that is has a Velcro backing. I found that the main compartment of the D.A.P Pack was large enough to carry my day to day items. The main compartment is slimmer than the average 3 day assault pack's main compartment, the slimmer main compartment makes the D.A.P. feel much lower profile. Enough room for what I need to carry without excess bulk. 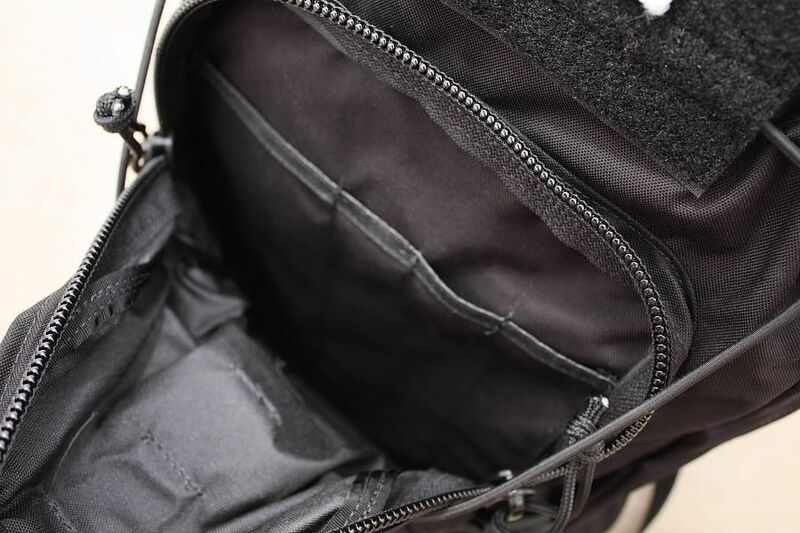 The smaller secondary compartment has an organizer sewn into the panel closest to the main compartment to hold pens, pocket knives, ID cards, or other similar sized items. The smaller secondary compartment is large enough to carry a rain jacket or windbreaker. On the outside of the pack just above the external secondary compartment is a 4" x 6" Velcro panel. 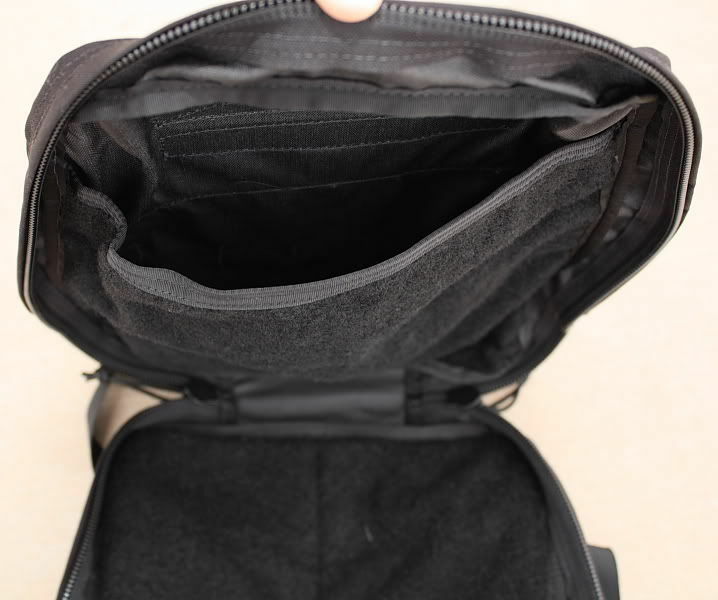 The secondary compartment has a 1" x 2" loop system that goes from the top of the compartment to the bottom of the compartment, and can be used for attaching things to the pack. There is also a bungee x-harness that can be used for attaching things to the pack or the bungee x-harness can be used to cinch down the pack. 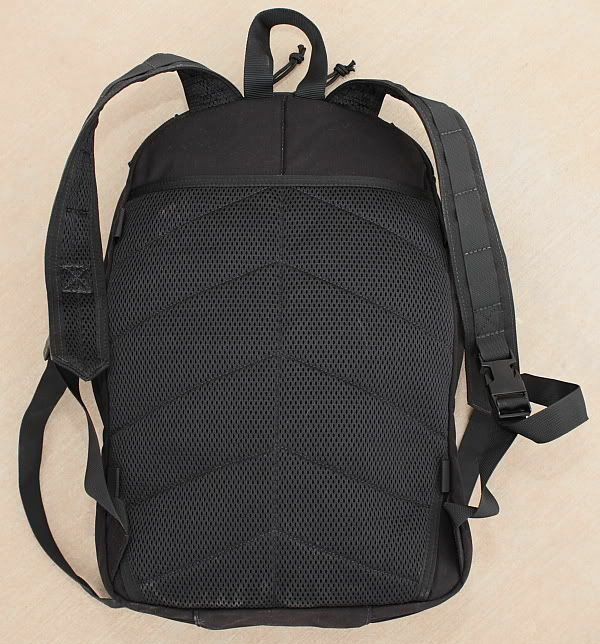 The shoulder straps are 2" wide non-padded shoulder straps and have the same 1" x 2" loop system on the outside of the strap that is on the outside of the secondary compartment. The 1" x 2" loop system on the outside of the shoulder strap can be used for attaching items to or routing items through the loop system. The underside of the shoulder straps are lined with the same mesh material that is used on the inside of the SOC-C padded belt system. I found the shoulder straps to be low profile and comfortable and think they would ride better on body armor than wider padded versions. The back of the pack is lined with the same mesh material and has an opening at the top. I couldn't figure out what the opening is for, but I'm sure it serves some useful purpose. The area between the mesh and the main compartment and is well padded. OK, so I've listed the features of the D.A.P. and my thoughts on why a smaller pack suits my needs better than the standard 3 day assault pack (for day to day use). Here are my thoughts as to what separates the D.A.P. small from other packs I have used. 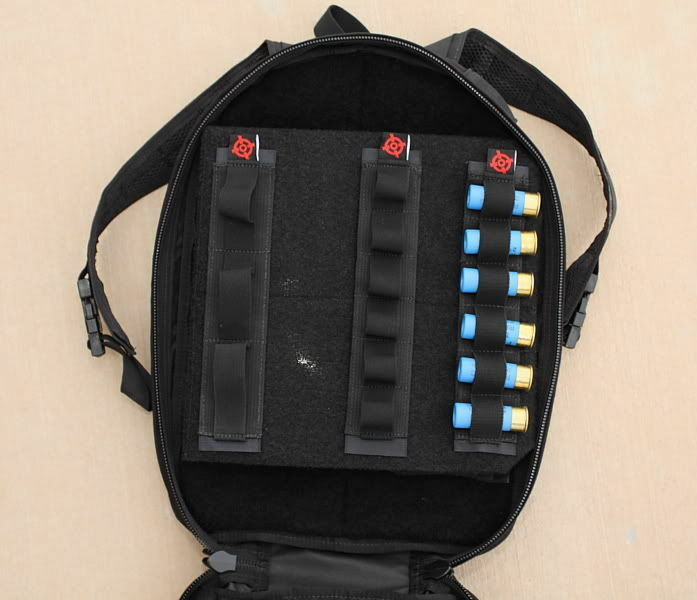 With most of the 3 day assault pack designs currently on the market (Eagle A-III, R.A.I.D, Kifaru, etc) if you want attach extra gear or pouches the pack this is done by attaching the pouches to the PALS webbing on the outside of the pack. This adds to the bulk and makes the pack even more cumbersome. The D.A.P is set up so that the pouches, loops, magazine pouches, pannels, etc. are attached to the inside of the pack. With use of the DAPPERS you can easily configure and minimize how much space this takes up inside the pack. The D.A.P. 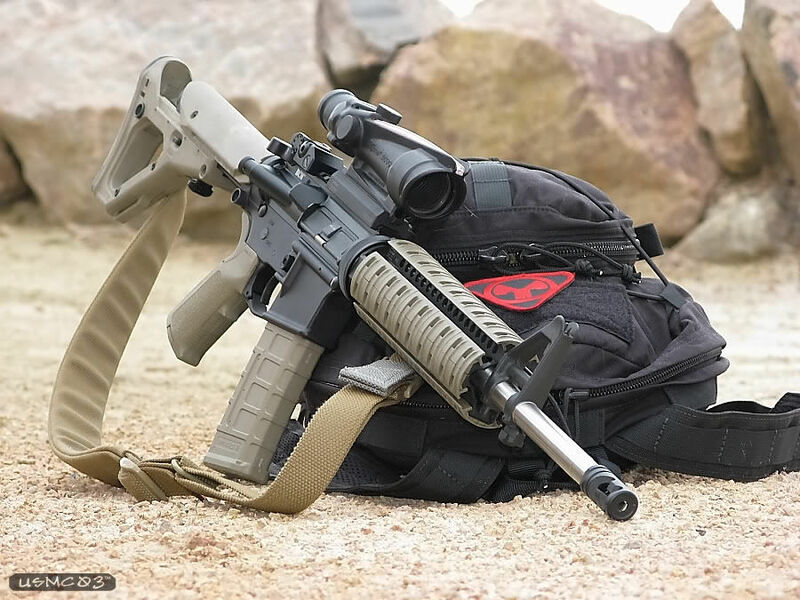 lends it's self to being used on a SWAT mission or surveillance much better than a 3 day assault pack due to the D.A.P. 's lower profile and more discreet appearance. I can use a black D.A.P. 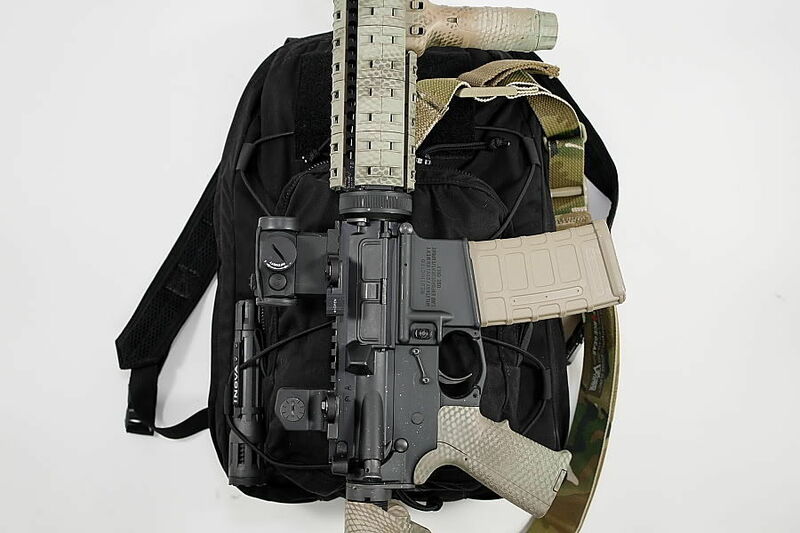 pack to carry extra gear on a SWAT call out and it looks like a piece of SWAT gear (it would be a great pack for a medical officer, chemical munitions, breacher, etc. The slim profile makes movement much easier in confined areas). 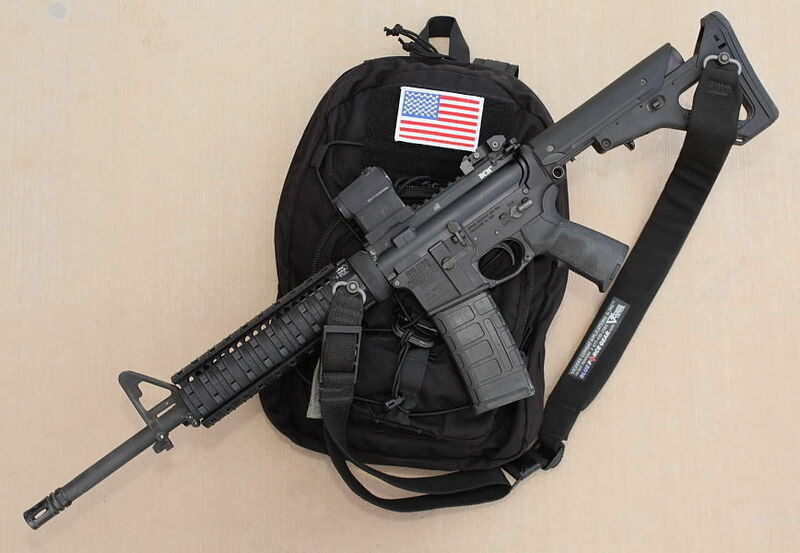 A couple days later I can use the same pack when I go to a water park with the family and no one thinks it�s a piece of military or police gear. And the following week I can use the same pack while working a plain clothes assignment - throw it on the back seat with a football and it looks like my kid�s backpack. It�s one of those pieces of gear that lends it�s self extremely well to wide variety of environments. After using the D.A.P. Pack for a while, I'm extremely impressed with it's size, features, modularity, and versatility, and will continue to use it daily. Things I would like to see. I've always been a big fan of internal frame sheets for assault packs. I would also like to see a small misc. pouch that could store a cell phone toward to top of the pack. Nothing worse than throwing a cell phone in a pack and then not being able to locate the phone when it's ringing. 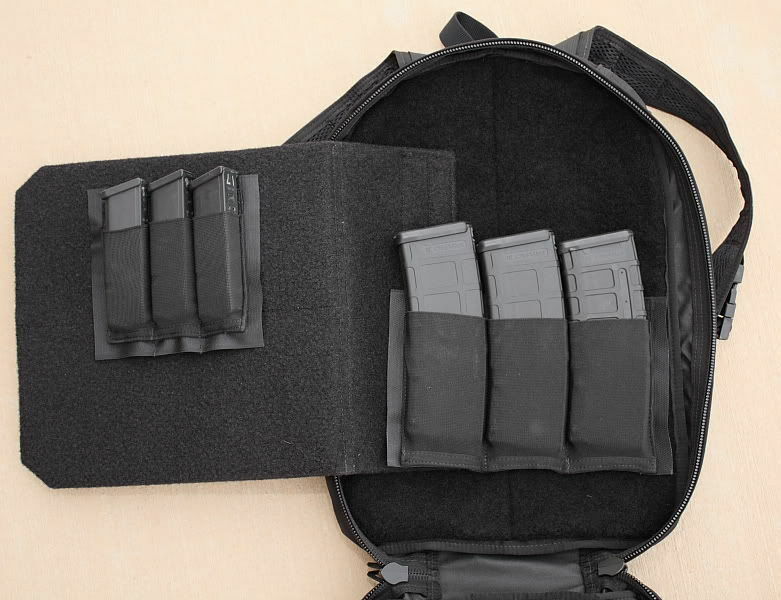 Single and double cell 10 Speed mag pouches (both pistol and M4) could add options when configuring the inside of the pack to maximize space. Hope the guys at Blue Force Gear are reading this. 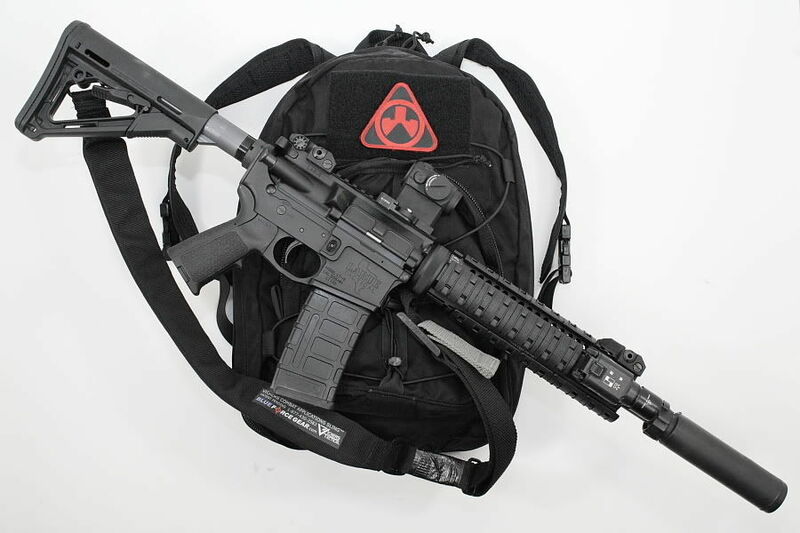 Dimensions: 11" by 21" and 1500 cubic inches The DAP� Pack is a super light weight day pack designed for low profile missions where weight and size are a primary concern. The pack can be cinched down further using the bungee x-harness. 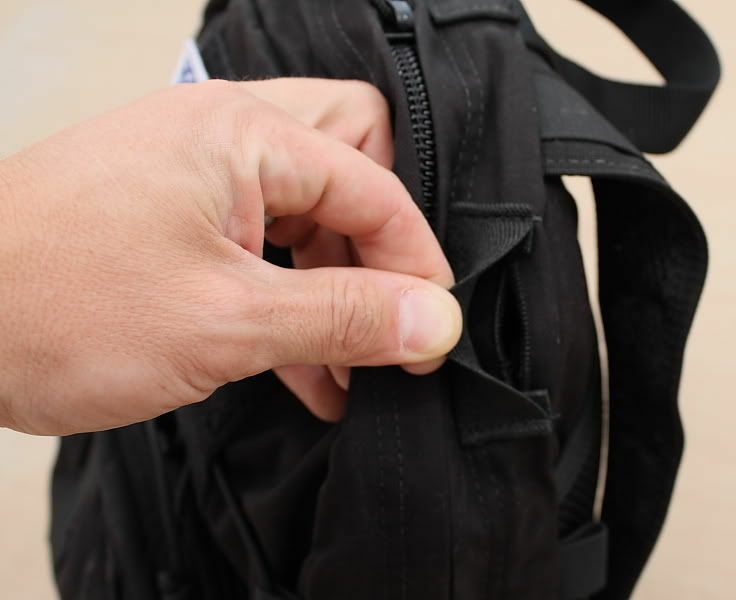 The interior of the pack is lined with hook & loop fastener for the greatest flexibility in mounting options. The back of the pack and the shoulder straps are lined with the same flash/flame resistant mesh that is found in our SOC-C Modular Belt. There are provisions on the top and sides of the pack for routing commo wires and hydration tubes. Available in non-standard colors for discreet use. The extension wing opened. The extension wing maximizes space and ability to mount several different pouches. Comparison pic. D.A.P. pack on the left (black). Eagle A-III on the right (tan). The D.A.P. just has a rain jacket and some other misc items in it, not even close to being full. The Eagle A-III if all the way full.